After the humiliating display on Wednesday’s accession protocol signing ceremony, when NATO used the Macedonian flag emoji to refer to the Macedonian language, when all other languages were listed by name, Prime Minister Zoran Zaev assured the public that he has been in touch with NATO and that the issue will be rectified in the future. Zaev insists that under the Prespa treaty with Greece the Macedonian language will be called just that – Macedonian – something that Greece may object to in the future, but even more Bulgaria, which is an EU and NATO member but doesn’t recognize the existence of the Macedonian language as separate from the Bulgarian. 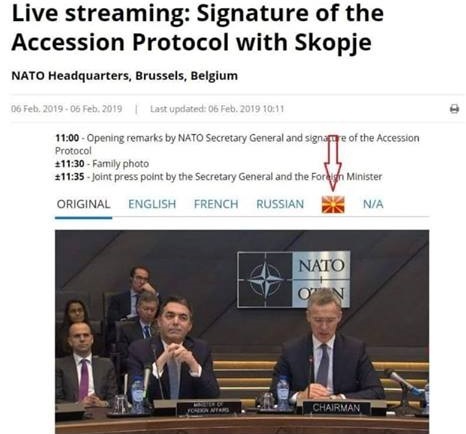 Still, despite Zaev’s assurances, NATO officials told the Mkd.mk news site that the name Macedonian will be used for the Macedonian language only after the Prespa treaty is fully implemented. This reply indicates that additional incidents like the one on Wednesday can be expected and that the matter will flare up within NATO, where Macedonia hopes to begin acting as a future member, pending the full ratification of the protocol.